Picking the right floor for your home is just as hard as picking a car. There are about as many options as there are types of paint to choose from. That may sound like a bit of an exaggeration but it’s true. Choosing the right type of flooring for your home is a daunting task and not to be taken lightly. There are plenty of options and materials to choose from and even more options to go along with it. Follow this article for tips on how to reach a flooring decision that is right for you and detailed information about popular types of floors that are available. Before picking a floor make sure to ask yourself a couple of key questions. Where will the floor be installed? Do you have pets or children? How is the floor going to be installed and what’s your budget? The answers to these questions will help drive your decision. If you have kids and pets, maybe you should opt for something more durable and low maintenance like laminate, vinyl, or even carpet flooring. Laminate floors are great as they can be stylish, more durable, and less expensive than regular hardwood floors. Vinyl is another great affordable option and great for bathrooms, kitchens, and basements. In terms of installation, vinyl and laminate are the most popular among DIYers. Both types of floors are floating and connect to an adjacent board, not a subfloor. Other durable floors that are great at handling moisture are ceramic tile and porcelain. When purchasing tile on a budget, nothing beats porcelain. Porcelain can offer the look and feel of more expensive floors such as marble, but sturdy enough to handle heavy traffic. If you’re looking at flooring areas of your home that are not heavy on foot traffic or susceptible to moisture, wood flooring offers a natural beauty and elegance that will make your home feel warm and cozy. Wood flooring is a great option if you have a little more room in your budget as its stain-resistant, easy to clean, and offers long-term versatility because it can be sanded and refinished. The prices for wood flooring can range from affordable to expensive depending on the quality and type of wood you choose. While wood flooring may come with a little more maintenance year over year, it’s beauty and aesthetic are worth it. For more greener flooring options, consider linoleum or cork. Both are made from all natural materials and ideal for wet areas like kitchens and bathrooms. Linoleum offers an extra anti-bacterial component which is why you often see these types of floors in hospitals. The last type of floor to consider is concrete. Concrete floors are rapidly growing in popularity and versatility. They are more durable than any of the floors previously described, offers the lowest maintenance, and can be customized and polished to meet your needs. Concrete has nearly zero limitations and the design possibility are endless. 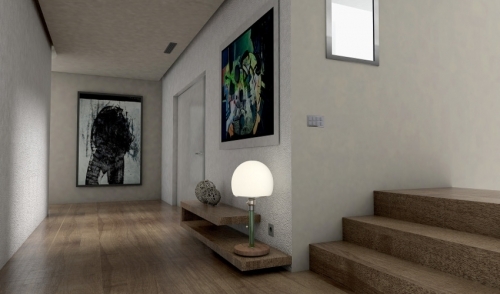 If you’re looking for something different, express yourself and try concrete flooring. Don’t hesitate to visit your local hardware store or showroom to test out and see as many options as possible. Ask yourself the right questions so you can manage the right expectations before making any decision. Use this article as a guide to develop your own shortlist of choices to explore and sample. Choosing may not be easy, but it’s all part of the fun of building a beautiful home.